Cirque Adrenaline opened with an almighty burst of power, fire and a lot of laughs at Arts Centre Melbourne last night, and the audience lapped up the on-stage extravaganza. Right from the onset, physical comedian Ross Steeves directs the audiences' attention to the stage with his silent hilarity. Thereafter, Cirque Adrenaline is close to 2 hours of unfaltering action. Act after act, the show's global performers showcase the very best of their talents, evidently at the peak of their physical abilities. Quebecker Sabrina Aganier, a little snowflake of an aerial artist, twists her tiny frame into a hoop above the crowd. Ukrainian Oleksiy Mruz, a second generation circus artist, wows the crowd with his Rolla Bolla balance skills. Not forgetting the Wheel of Dealth duo, who have the audience hiding behind their hands, as they transcend from the most ridiculous spinning circular high-heights. 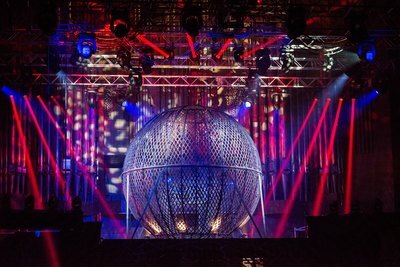 The same performers, complete the show's finale, on motorbikes, spinning in the Sphere of Fear. The Extreme Team bounce, leap and balance with insane strength, and things heat up with intensity when Dai Zaobab and Robert Horner hit the stage combining acrobatics, choreography and real fire. The clown of the show, Ross Steeves, links each act with plenty more LOLs and audience participation. His balloon antics have the crowd in stitches. Cirque Adrenaline runs for two hours, with a 20-minute interval. This powerful show entertains the young as much as the young-art-heart, although bear in mind, the age recommendation for children is 6 years plus. Although a little different from your usual circus-in-a-marquee performance, Cirque Adrenaline makes up for its lack of Big-Top intimacy, with an insatiable appetite for non-stop gutsy entertainment. Cirque Adrenaline performs at Arts Centre Melbourne for 11 shows only.